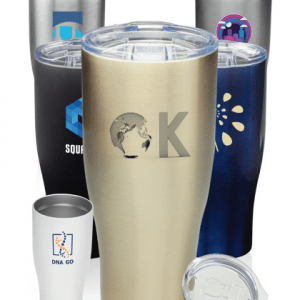 Available in your choice of white, black, blue, stainless silver or gold, these stainless steel custom travel mugs with built in grip are great promotional items for the office or trade show convention. With up to a 27 oz. 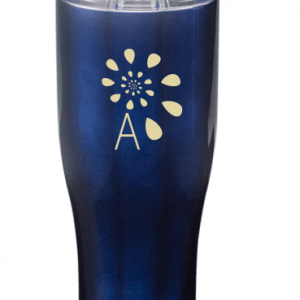 capacity, they have a jumbo size complexion and large imprint area that can be printed or engraved with your logo, plus BPA Free feature that’s sure to reel in a crowd. The clear plastic lid has a suction closure, and slide lock to prevent spills. A double wall vacuum insulation design helps keep the temperature of your drinks longer. Order wholesale to ensure every one of your employees or guests receives a piece – our Guaranteed Low Prices are a bargain! 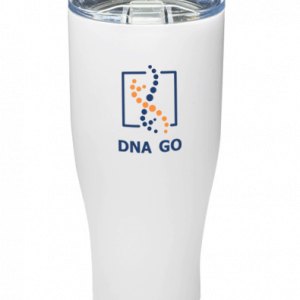 Get started on these stainless steel travel mugs now. Free Shipping available.